At the top of the Midrahov (main street) just past the Great Stairs you will see the Davidka Monument. The area has been refurbished in the past few years and there is plenty of seating for groups while they learn the history of the War of Independence. In addition to the information posted on the memorial stone, there is an audio information post which tells the story of the battle for Safed in both Hebrew and English. 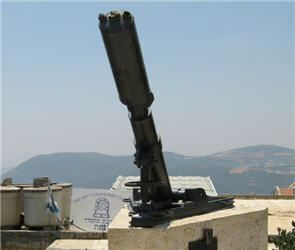 The Davidka cannon was crucial in the battle of Safed during Israel's War of Independence. The Davidka was a primitive mortar or cannon that was very inaccurate. It was based on a Czech weapon and David Leibowitch, its designer, was able to construct it in secret during the pre-independence period. As a home made weapon its effectiveness was more in the amount of noise it made, rather than on the shell's ability to deliver a decisive blow. The 3 inch shell was filled with whatever the fighters were able to get hold of, and its bark was definitely more than its bite. The Yiftach brigade of the Palmach and the Irgun fighters combined forces during the battle for Safed and used the Davidka in the battle for the Citadel, during the night of 9th -10th May 1948. The fighters set up the Davidka in front of the Ari Synagogue in the Jewish Quarter of the city (now the Old City) and attempted to shell the Arab positions, which included the city's police station. Due to its ineffectiveness as a weapon, historians are unsure about how much actual damage the Davidka caused. However, when the Arab fighters and residents of the city heard the Davidka fire, the noise produced was so terrifying that they thought it was a new secret weapon of the Jews. This maybe part of the reason why the Arabs suddenly evacuated the town during the decisive battle for the city. Opposite the Davidka monument you can see a pillbox that juts out into the road. On the other side of the road is one of the buildings of Safed College. During the Mandate period these two buildings were part of the city jail and police station compound. Before the British left the town they handed this strategic location to the Arabs. During the battle for Safed it was essential that this extremely important site was captured and there was fierce hand to hand fighting over the location before the victory went to the Palmach (the armed wing of the Jewish fighting unit Haganah). If you look you can still see the bullet holes in the two buildings. Even though the old pillbox has no practical use today it has been left as is due to its historical status. In recognition of the importance of the Davidka in the liberation of Safed, the Davidka monument was installed on this site on the 29th April 1956. The ceremony was attended by its inventor David Leibowitch, and honored the fighters who fell during the battle for Safed. Now every year there is a memorial ceremony in front of the Davidka, on Remembrance Day, when the city honors its dead, and a wreath is laid on the cannon itself.